Ffos Las is located between Trimsaran and Carway to the northwest of Llanelli, Carmarthenshire. The landscape of Ffos Las is essentially �a smooth bottomed shallow valley�, with open views to the hills in the west and northwest and to the sea in the southwest. It is an area of striking character and natural beauty. To the west lies the historic town of Kidwelly with its Norman Castle and to the north lies the Gwendraeth valley which forms a natural link to the coast from the M4. Future infrastructure plans for the area include the creation of a new link road to the motorway which will pass immediately adjacent to the site. Ffos Las is within 3 miles of the Pembrey Peninsula, as area of reclaimed salt marsh extending into Carmarthen Bay. The Peninsula is an area of outstanding natural beauty, part of which has been designated as a Special Area of Conservation of European Significance. The Peninsula contains the Pembrey Country Park, which has become the leading tourist attraction in Wales, a motor racing circuit operated by the British Automobile Racing Club (BARC) and Pembrey Airport, all of which have significant development proposals planned over the next few years. The site at Ffos Las is well located with a climate beneficial to horseracing, due to the unique weather conditions provided by the coastal environment and the Gulf Stream. Cancellations are likely to be far fewer than at most inland racecourses. The racecourse at Ffos Las will bring a sport to a population with existing strong links to racing, as demonstrated by the support of point-to-point activity in South Wales and the high betting turnover in the region. Of the 59 racecourses in Britain, only two are in Wales. These are both located on the Welsh/English border and as such, the population of Southwest Wales are effectively excluded from attending horseracing events. The nearest racecourse is Chepstow, 90 miles away or, for some of the West Wales population, Wexford in Ireland. The Ffos Las course would therefore be attractive to a public for whom racing may have been an inaccessible spectator sport, along with the Irish racing fraternities. 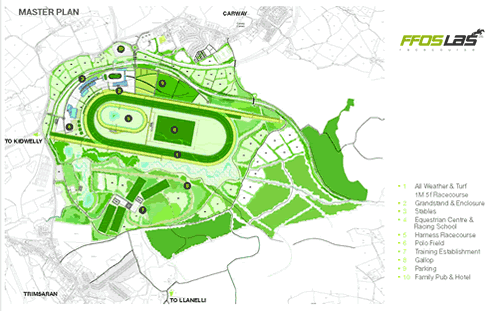 This project will bring racing back to southwest Wales and become one of the first new racecourse developments in the UK for over 75 years. The racecourse will cater for both Flat All Weather and National Hunt Turf racing, and provide the necessary technical buildings and services required together with a number of unique facilities to enhance the experience of a �day at the races�. The project will also become an equestrian centre of excellence for Wales through the incorporation of training facilities, horse jumping and dressage arenas, a harness racing circuit, point-to-point and 3-day event courses. Ffos Las Racecourse Limited is a joint venture between Pembrey Racecourse Co plc and The Walters Group. Pembrey Racecourse Co plc was formed over ten years ago to develop proposals for horseracing in southwest Wales and secured British Horseracing Board fixtures in June 2000. The directors of the company have over 30 years experience in the horse racing industry and this experience has been fully utilised in the racecourse design and implementation of the project so far. The Walters Group was established in 1982 developing a plant hire, civil engineering and mining business. The group undertakes civil engineering and earthmoving projects across the UK. Ffos Las is part of an expanding portfolio of land owned by the Walters Group who will bring their considerable expertise in large scale Civil engineering work to the project.